Old-school anaglyph glasses at the ready! 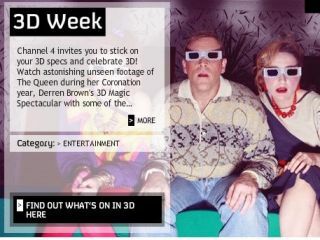 Channel 4 begins its three dimensional onslaught this week, with the arrival of its 3D week. Unlike Sky and Virgin Media, the channel isn't showing off some spangly new technology but using the anaglyph technology (red and blue lenses) of old to bring some of its content that little bit more to life. When the themed week was announced back in August, there wasn't much to go on with regards to content. We knew the Queen would be shown in another dimension, as would some stuff by Derren Brown. Luckily the list of programmes was unveiled last week and it seems that Channel 4 has tried to go as eclectic as possible with its line-up, which includes Hannah Montana and, bizarrely a movie from Andy Warhol's factory output – Flesh For Frankenstein. For those who don't fancy seeing the horror of Frankenstein (or Hannah Montana for that matter) in 3D, then you're in luck as two new late additions to the line-up have been unveiled: T4 in 3D and The Paul O'Grady Show in, of course, 3D. It's as if someone shouted 'we need something more mainstream' and a little Channel 4 robot has swiftly replied. As the 3D programmes don't start till tonight, there's still time to run down to your local Sainsbury's store and pick up some free 3D glasses. Or you could just check under your settee as that's probably where you chucked your last pair of 3D specs out of anger after Jaws 3D didn't quite have the effect it promised.